Hello and welcome to Raring2go! the go-to-guide for you and your child! Between the magazine and the website - we've got it covered! Hello and welcome to Raring2go! Glasgow - helping you find places to go and things to do with your children locally - the best places to go, things to do, days out with the kids, places to shop, play, eat and stay. There are lots of events and activities coming up this season, which you'll find in the What's On? calendar above. To view the latest issue of the magazine, please click the image to the left. Join me on facebook here for daily updates and extra competitions, or tweet with me on twitter! We started 2018 as we mean to go on - with a fresh, contemporary and punchy new look: We’ve got a new logo and strap-line and we’re really excited about making a great first impression with our new look. But even though it’s all change on the front cover, it’s still all the same good stuff on the inside, and that’s more of the same brilliant family focused content our amazing audience has grown to know, expect and love from Raring2go! 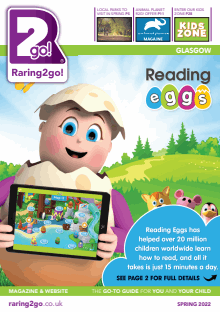 To find out how you can promote your family-focused business with us, email Victoria - glasgow@raring2go.co.uk or call 03333 443565. Or watch our video to meet the team, see where we are based and what we do to get each fantastic issue of the magazine out to you! Mother's Day Piñata Cupcakes for you to make for Mum! Chocolate perfection for Valentine’s Day this month.